Littlehampton Town Football Football Club have been rocked by the departure of Lee Garnham and George Gaskin. The experienced pairing have decided to make the step in to the Bostik League South and join Shoreham. Gaskin, who started last season with Mussels, has been dual-signed with Shoreham’s league rivals Horsham all season – featuring for them on a few occasions. For Garnham – an SCFL Premier Division title winner – it is a first venture into Bostik League football. The deal for Gaskin is expected to go through by the end of this week, while Garnham made his Shoreham debut in their 2-1 home defeat to Horsham on Tuesday. Littlehampton boss Ady Baker is disappointed by the departure of both but believes this will now allow other players within his squad to flourish. He said: “It is frustrating to lose both but what it does do now is give other players in the team a chance to show what they are capable of. “George (Gaskin) was a massive player for us last season after coming back from Shoreham. He was our top goalscorer and played a massive part in keeping us in the division. “If you look at his record so far this season, he’s struggled for goals. I wish him all the best at Shoreham and hope things work out for him. Ten-man Golds secured a 4-2 Sussex Senior Cup home win over division-lower Southwick in their first match since the departure of both on Tuesday. Lucas Pattenden was at the double, while both Jack Cole and Ben Gray struck in the victory. Pattenden fired Golds ahead after 15 minutes but Ben Symes’ clever flicked finish drew Wickers level nine minutes later. Youngster Pattenden struck again two minutes before the break to fire the home side back ahead. Kieron Playle-Howard handled on the goalline eight minutes after the interval, resulting in him being shown a straight red and Southwick awarded a penalty. Zak Haulkham stuck it away to leave Littlehampton with it all to do. Golds were not to be denied, though, with Cole – 20 minutes from time – and Gray ten minutes later sealing their progress. 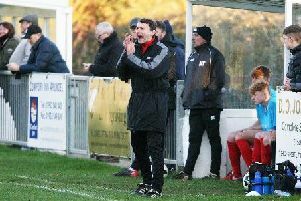 Littlehampton boss Baker believes exciting times are ahead, with new additions expected early next week. He added: “It was a good win and showed what the team is capable of, even without both George (Gaskin) and Lee (Garnham). “A few squad players will have a chance to shine now and I’m sure they’ll take it. I’m talking to a couple of potential new recruits, so it’s exciting times at the club. LITTLEHAMPTON TOWN: M.Bromage; Farrell, Chaplin, Zydonik; Cole, Playle-Howard, O’Callaghan, Gray; Laing, Pattenden. Subs: Hutchings.